Figuring out the dolphin’s facebook! For my project, I am working with Shelby and Danielle to analyze the acoustic activity of humpback whales off the coast of Panama, a popular breeding ground which both northern and southern humpbacks migrate to/ pass through. Humpbacks’ songs are composed of units, phrases, and themes that are repeated in a specific order, and the song is often repeated several times. Many aquatic species utilize acoustic communication for mating, socializing, and predator alerts. However, a large threat to such species is anthropogenic noise, which includes any sound produced by or resulting from human activities. In Panama, anthropogenic noise is especially prevalent from fishing and whale watching vessels which pass through these precious waters. All of the dark patches along the bottom of this file are parts of the singer’s song. This audio file was very clear and you can hear the repeats of the various parts of the song. Hopefully if we have enough time at the end of the semester, we can take a file like this and map out the sonic structure. As a side research question, I would be interested to see if the structure of the songs differs between northern and southern humpbacks. Not all files are as clear as this one, which posed a challenge as I sorted through the first day, but hopefully I will become very accustomed to what to look for and the process will get easier and quicker. 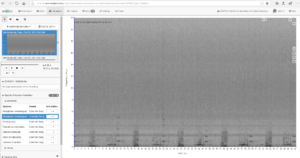 Interestingly, in a large amount of the recordings there is a low frequency sort of grunting sound, which neither myself nor Dr. May-Collado has yet been able to identify. Our research project is centered around the acoustic behavior of male humpback whales (Megaptera novaeangliae), particularly the Southern Pacific humpback whales whose main breeding grounds lie off the coast of Panama. We are investigating the whales’ singing behavior over the course of the day in addition to seasonal patterns, as these whales tend to migrate out of the area starting in late November. We are also focused on the effects of noise pollution on these animals, and are investigating whether differing levels of boat activity impact how and when the whales sing. We are using passive acoustic monitoring data that were recorded by Dr. Laura May-Collado and her colleagues from three sites off the Pacific coast of Panama: Islas Secas, Coiba National Park, and Archipelago Islas Perlas. My research project is to describe the acoustic repertoire of the Antillean Manatee using over 50 hours of passive acoustic recordings taken throughout 2018 at a resting hole about 6 miles from the coast of Belize. My work is in collaboration with PhD student Eric Angel Ramos, who is studying the behavioral responses of manatees, dolphins, and whales to being observed by drone. In the future, the sounds I’ve selected may be paired with his data to make conclusions about vocal behavior as well as observable physical behavior. What I’m aiming to describe in this project is the vocal parameters of their sounds (min/max/peak frequency, duration, power), unique qualities or “types” of sounds, and the factors (such as time, temperature, season) that affect these qualities or the frequency of the sounds themselves. But in order to describe manatee sounds, I first had to find them. 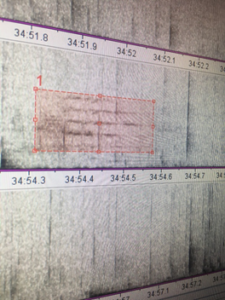 Identifying manatee sounds was the first real challenge I faced in this research project, as passive acoustic monitoring data is a lot noisier and more confusing that just holding up a microphone to a manatee. On top of having to learn how to use RAVEN, an acoustics program, I had to learn how to recognize and filter through many different types of sounds in order to find my first manatee squeak. After going through ten hours of data in ten second increments, after many hours of just sounds of snapping shrimp, ocean waves, and the occasional fish, I found my first manatee. Despite my initial challenges, the number of identified manatee sounds has steadily grown over time, so now the time to think about data analysis is rapidly approaching. Very little is known about the possible types of vocalizations made by manatees or what factors affect them. 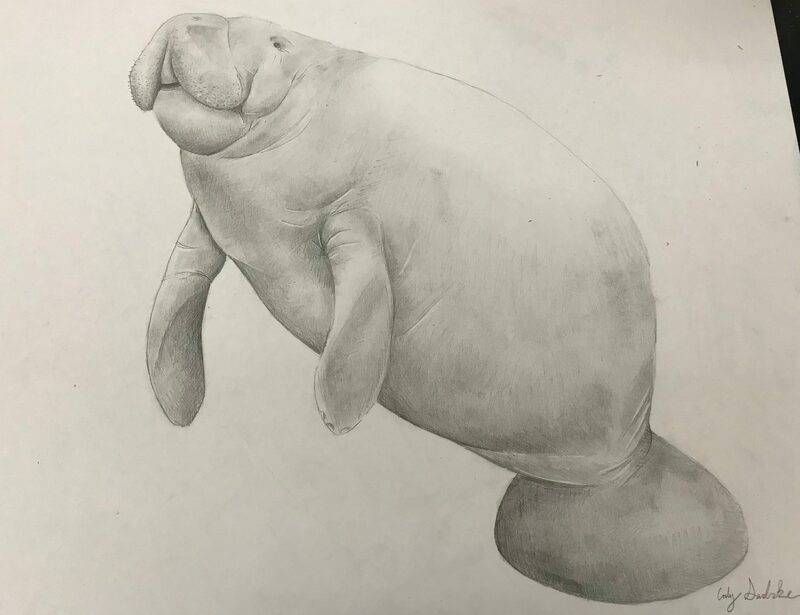 There is not a universally accepted language for describing types of manatee sounds, so much of the data analysis will focus on the vocal parameters themselves, rather than categorizations of sounds and their social contexts, as I had originally hoped to study. It just goes to show that throughout the research process, your question can change to better reflect the data and present scientific context. The thought that I could potentially contribute to this field is both exciting and terrifying. In spite of my fears and challenges, I know the final product will both be valuable as data for the field of marine mammal bioacoustics as well as experience with the research process. While manatees admittedly do not have the most complex social structure or acoustic behavior, this research has opened my eyes to new possibilities of incorporating animal behavior with ecology and conservation actions. Understanding how animal populations vary through time and in respond to human activities can be challenging. However, understanding population dynamics is key to make long-lasting management decisions. 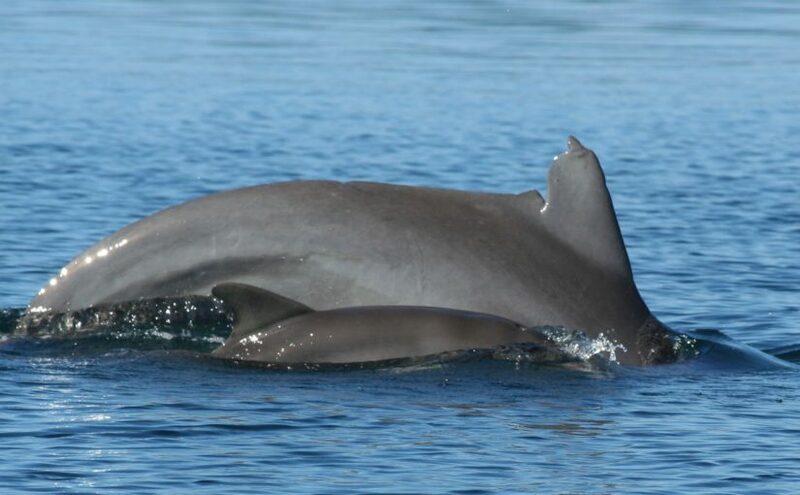 In this project Amanda is taking over 15 years of data, by using capture-recapture data she will generate population size estimates for the population of bottlenose dolphins of Bocas del Toro. This population is recognized by the International Whaling Commission (IWC) as of concern given the impact boat-traffic has had on these area. My research project is to determine the population size of the bottlenose dolphins in Bocas del Toro, Panama. Four other students and I are processing photo identification data and entering presence/absence for each dolphin into a matrix. The data we are currently working on is from July 2014. There is also photo ID data going all the way back to 2004. My job is to take this giant matrix and use computer programs such as SOCPROG and MARK to determine the size of the population and growth trends over the years. Hopefully my findings can be combined with other genetic data and population health data in order to push for further legislation to protect these beautiful animals. To identify the dolphins, we look at photos of their dorsal fins and look for unique notches or other defining marks. There are two catalogues with dorsal fin photos of known dolphins for comparison. If we are unable to identify one, we list it as an unknown and it will either be determined to be a known dolphin that we were just unable to identify at the time, or it will be a new dolphin that we get to name! Working with photo data has definitely had its ups and downs. Some days we can identify every single dolphin with no problem. Other days we just keep getting unknown after unknown, which can get rather frustrating. We have definitely become very proficient at knowing many of these dolphins without even having to look at the catalogues. For example, I can tell you from this random Google images photo that this dolphin is Bity based on the super unique pattern on her fin. Bity is one of our favorites because her fin is so unique and easy to pick out. However, she is a rare case and many of the dolphins have small notches in similar locations, which leads to everyone having a different opinion about who it is. After lots of arguing and yelling about who the dolphin could be, we either all finally agree on who it is or we give up and mark it as an unknown. Even though identifying dolphins can be super frustrating, annoying, and exhausting, it is very satisfying when we can get on a roll and actually identify some. Once we get through as much ph otoID data as humanly possible (by the end of this week), I will have to format the matrix and start using computer mathematical models to model the population over time (yay math!). I have started to familiarize myself with some models and SOCPROG, but I still need to learn how to use MARK because that program is made specifically for population modeling. Hopefully the models I create can be used as further evidence that these dolphins need protection. 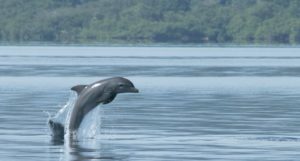 My research is focused on the social structure of the population of bottlenose dolphins living in Bocas del Toro Panama. Right now I am working with other students in the class to identify the dolphins from photos taken of their dorsal fins in 2014. Then I will use that data as well as data from the previous ten years to analyze the social structure using SOCPROG. I don’t know how to use SOCPROG yet though, so I’m just going to talk about the photoID experience. There are five of us that are using the photoID data in our research, so we all work together when identifying them. Two or more of us will meet three to four times a week for about two hours and go through the photos and identify them. It can be challenging to find a time that works for all of us, luckily we all hold each other very accountable. We look mainly for the placement, size, and number of notches they have on the back of their fins. 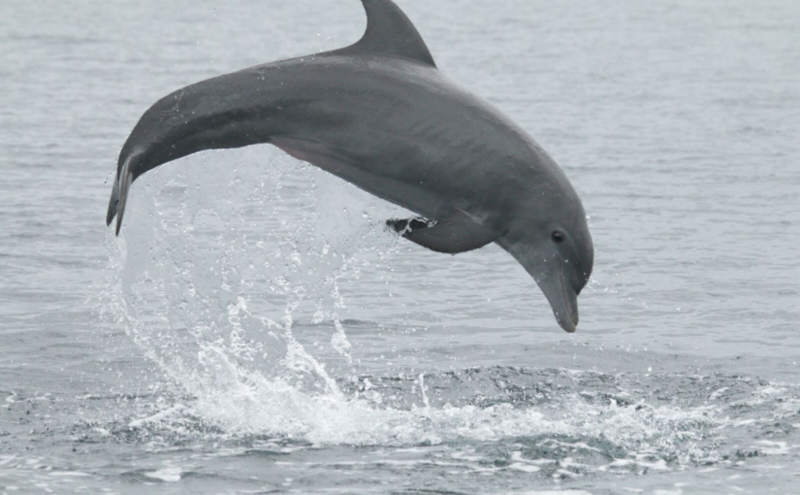 We use two catalogs of identified dolphins in Bocas del Toro to match them. If we can’t figure out which dolphin it is, we either put it down as Unknown. Later we will go back through to try to identify them, and if we can’t we say it is a new dolphin and give it a name. A challenge we have faced is it turns out most dolphins have similar dorsal fins. With the exception of a some very unique fins (we love you Bity, SuperMessy, and Halfin), it can take us a long time to identify each picture. 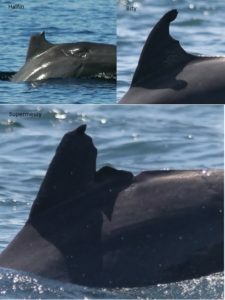 In addition some of the pictures aren’t the best quality so it is difficult to see the smaller notches, and sometimes the dolphin is at an angle that makes it look different. This leads to a lot of unknowns, and a lot of heated arguments. It is incredibly frustrating when the fin looks easy to identify, then ten minutes and a little yelling later we have to mark it as unknown. Despite our struggles, we have gotten a lot better at identifying them. The first few days were very rough, but now we are all familiar with them and have our favorites (RIP Zig-Zag), so we can move through them quicker. I’m hoping that we can get through all the photos we planned to by the beginning of November, so I can move onto figuring out how SOCPROG works. 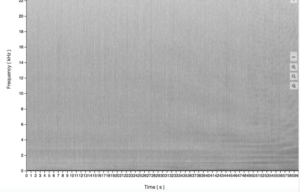 Why and when male humpback whales sing? Students Shelby Rosten, Kate Ziegle, and Daniella McAree are taking upon the tasks of answer those questions. They are going over thousands of recordings collected with two underwater recorders called soundtraps (see photo) to document the singing behavior of Southern Hemisphere humpback whales wintering in the waters of Panama. Here is Shelby’s experience. 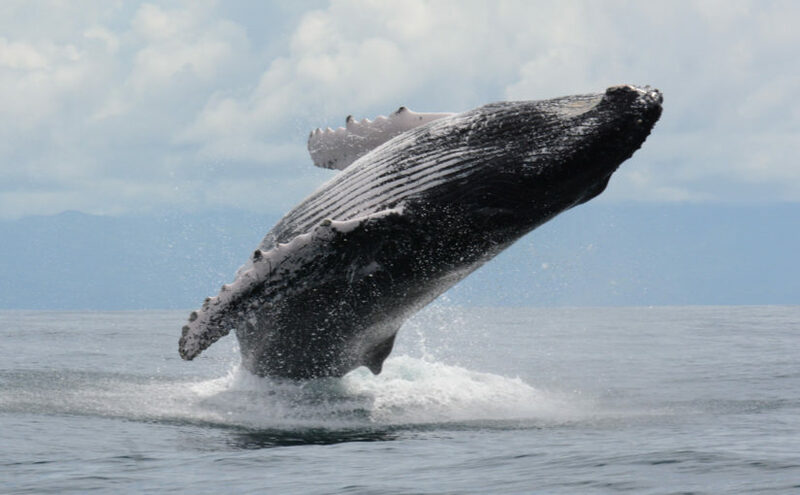 Our research is focused on the activity of humpback whales (Megaptera novaeangliae) off the Pacific coast of Panama. We want to find out at what time of day they are singing, when they arrive to Panama, and when they leave in the spring. We also want to investigate the impact of anthropogenic noise on whales’ behavior. We are becoming increasingly aware of the impact of man-made noise on animals. Especially in areas with a lot of boat traffic, low-frequency noises can potentially disrupt the vocalizations of whales since they use primarily low-frequency calls. To explore the impact of anthropogenic noise we are comparing the activity of whales at three sites of varying traffic and also analyzing the relationship between the presence of boats and the presence of whales. 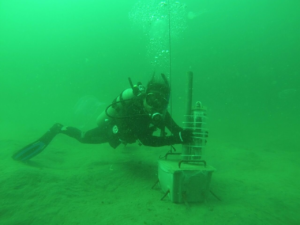 We are using passive acoustic monitoring data that was collected by Dr. May-Collado and her colleagues. So far we have been working on processing our data and uploading it to ARBIMON to be analyzed l ater. We started off slowly but have finished our first site which was off the coast of Islas Secas! This site is unprotected but a lot of whales hang out there and we’ve seen songs in some of the recordings. This site has one month of data and we took one minute samples every five minutes for the duration of the monitoring. This was pretty time consuming as it took about an hour to sample each day. Now we have moved onto Coiba National Park. For this site we have about six months of data but in terms of processing we only have to trim the sound files. This means each day only takes about ten minutes so we can move through them much more quickly. Once we finish this site we will start on data from Islas Perlas. This data is a little more complicated to process because we have to stitch together short pieces of recordings into one minute samples. I think that so far we are making good progress with our data! The most frustrating thing, I think, has been finding time to come into the lab while also getting all of my homework done. Doing research is a really time consuming process, especially at this stage. I am grateful that I have two other people helping me because we can keep each other accountable and get through the data more quickly. 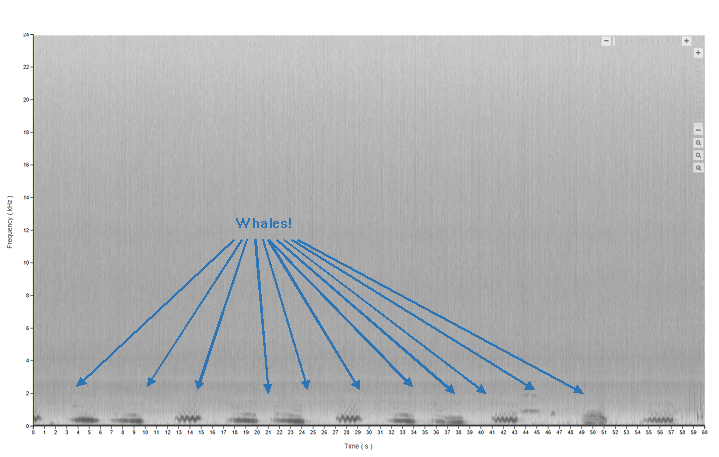 I am excited to start analyzing the data because I have noticed some whale songs in a couple files which is really cool (see figure below)! I love whales and I eventually would like to study them and help to promote their conservation so I’m excited to see where this project goes and to contribute to the scientific community. 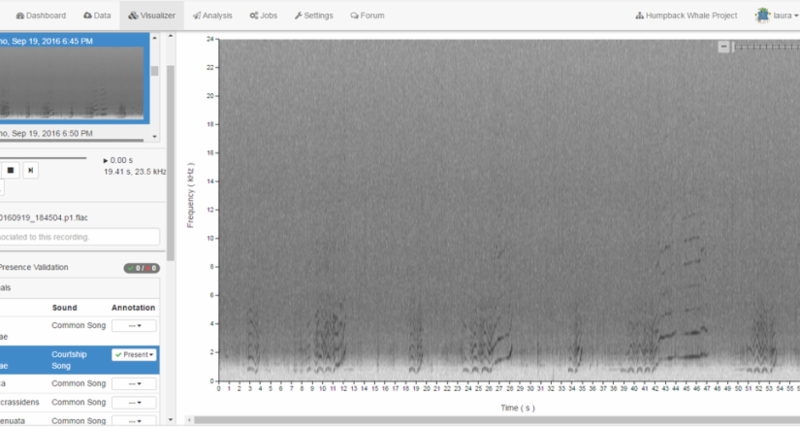 Delfines en Jardin a las 1:59 a.m.
For the past year, I have been working on identifying signature whistles of bottlenose dolphins recorded using passive acoustic recorders deployed in the Archipelago of Bocas del Toro, Panama. My work is in collaboration with graduate student Betzi Perez at McGill University and Dr. May-Collado. Signature whistles can be thought of as names for dolphins. Each individual dolphin has a unique signature whistle that they use to maintain contact with one another. Dolphins can even copy each other’s signature whistles to call specifically to one another! This year in CURE I am going to go even further with this topic. As the dolphins in Bocas del Toro have been well photographed and recorded, I am going to attempt to match signature whistles to the dolphins emitting them. 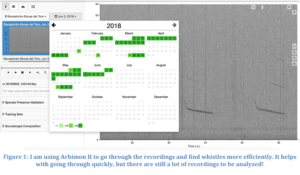 Currently, I am still going through passive recordings to expand my signature whistle catalogue, but once I have finished, I will look at older recordings done using a research boat in hopes of matching signature whistles emitted with dolphins spotted at the same time. 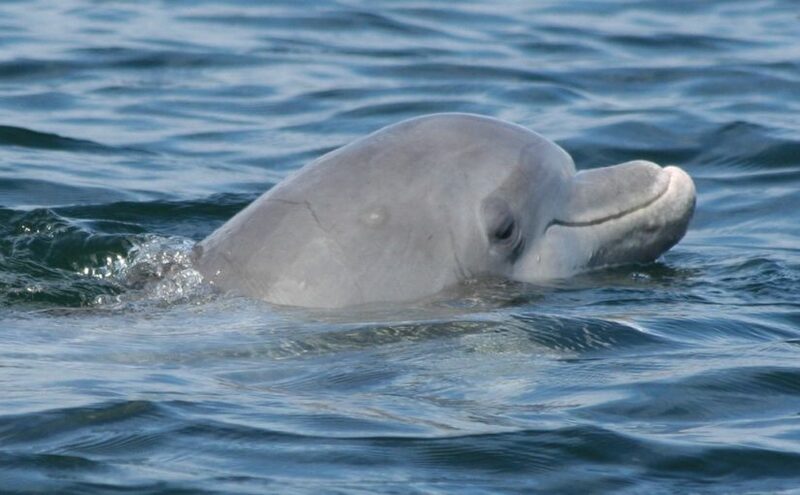 If this goes successfully, dolphins in this population will be able to be identified using just their signature whistles from passive recordings! The trouble I am facing at this point in my progression is just going through the vast amount of recordings. With three more locations as well as older recordings to analyze, there are a lot of recordings to sort through. 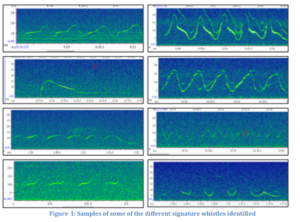 Each recording needs to be looked at, and the whistles found identified as signature or not. However, as long as I stay on schedule in my work, I will be able to finish and have a lot of data to analyze. After sorting through the recordings my next step will be to potentially match the whistles with the dolphins, which will hopefully lead to a better understanding of these animals and their behavior. During this CURE course students will be engage in all aspects of research: literature reading and discussion, asking questions that can be answer during the semester, collecting, processing, and analyzing data, learning how to interpret analytical results and how to communicate the results to the public and scientific community. Students will learn that science is not about eureka moments! Good science takes time, involves failure, troubleshooting, discussions, re-evaluations, and yes frustration. Good science is always challenging at different levels, from collecting the data to its analysis. Finally, students will learn that not all research projects are equal! Different questions, systems, or species will require different approaches. For example, some research questions rely on well-planned experimental designs involving multiple controls. My research is field based so is bound to be limited by replication, sample size, lack of controls (because there are impossible to have! ), logistics! However, field based projects are essential for our understanding of our biological world, and are often the spark for more sophisticated and controlled studies. In this blog CURE students will be sharing with you their experiences as they develop their projects in topics related to animal communication, soundscape ecology, and marine mammal ecology and behavior. Stay tuned!